A Stylish Way to Get Some Extra Heat. It’s frigid here in Washington DC today. The sun is ablaze but the wind calls for the warmest of mittens. With these Fall season temps, those lower level rooms in row homes and condo buildings are definitely feeling the chill. 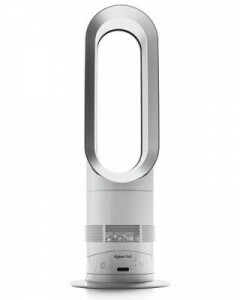 I have my eye on the prize – that is the new Dyson oscillating heater. I saw it at Best Buy a few weeks ago but short sleeve weather made we walk right on by. Noted. Now, I’m ready for the splurge. Equipped with long-range heat projection and a fan function, it allows you to fine-tune the temperature to your own comfort level. Plus, it’s less than two feet in height. As a designer, the looks suits any room beautifully. If you need the extra heat, put this one on your holiday wish list. The sweet look comes in a white-silver or iron- blue. The cost? A well worth it $400 bucks. 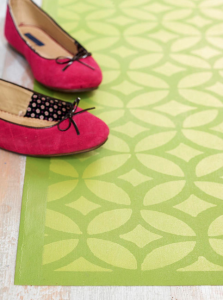 Base-coat your rug material if desired. After the base coat dries, use a straightedge to guide your stencil placement. Apply your design in a contrasting color with a stencil brush and stencil, cleaning the stencil before moving it to a new section. When the paint is dry, seal and protect the design with clear polyurethane. Before painting walls, wash them with trisodium phosphate (TSP) and repair any cracks or holes. If your house was just built and your walls have not been painted before, it’s a good idea to apply a wallboard sealer before painting. For old drywall and plaster, a stain-blocking primer can help hide water stains or other marks. To paint a wood floor, clean and sand the surface (filling any cracks with wood filler), then apply an oil-base sealer. You can use either oil-base or latex paint. Alkyd or modified epoxy latex porch and floor paint is a good choice for high-traffic areas. A polyurethane coating (a type of varnish) will help protect painted floors. You might want to use a water-base varnish because oil-base varnishes yellow over time. Use a roller with a long handle to cover large floor areas, although a brush is fine for small areas. Remember to plan your escape route: Start in a corner and work toward your exit to avoid stepping on wet paint. Clean the surface with a stiff wire brush to remove flaking paint or rust. Wipe with a damp cloth and let it dry. Prime with metal primer and let dry, or use a paint specially formulated with rust inhibitors. Apply several thin coats of paint. If using spray paint, hold the can about 10-12 inches from the surface as you spray. Shake the can during the application to keep the color mixed. Spray lightly to avoid paint runs. Tape preshrunk fabric to plastic-treated cardboard. (Place the cardboard inside a pillow cover in case paint soaks through.) Use fabric paint or an acrylic paint with textile medium added. Apply the paint in several thin coats to work it into the fibers. Heat set if required. Your piece can be laundered with mild detergent after 10-14 days. Sand the surface lightly to ensure paint adhesion. Clean the surface with trisodium phosphate (TSP) cleaner to remove grease and dirt. When dry, apply a bonding or ceramic primer. Let the primer dry. Brush on latex paint in a gloss or semi-gloss finish. You also can use a paint formulated for ceramic or porcelain surfaces. Allow the paint to dry for several days and take care not to scratch the paint while it’s curing. Start with a clean, dry surface. If you use a pattern, tape it to the inside of clear glass. With an artist’s brush, apply a thin layer of glass paint for a stained-glass look. For an opaque finish, apply an additional coat after the first is dry. Paint slowly and gently to avoid bubbles. Using an artist’s brush, seal the design with glass-paint varnish. If you want the look of frosted glass, use a varnish with a matte finish. 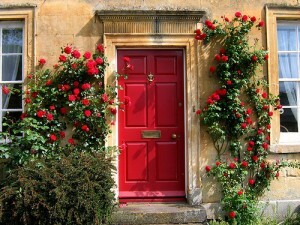 We all know that a red front door adds instant curb appeal, but what does a red front door symbolize? A lot, actually. It’s hard to pin down a specific origin of the red front door, but after a little research,ShelterPop.com traced the tradition back to Biblical times. As history goes, Hebrew slaves were instructed to paint their doors red to protect their first-born from the angel of death. Many churches also painted their doors red, with the belief that once you passed through it you were protected from evil. And in early American times, if a family had a red front door, travelers passing through by horse and buggy would know that a home was a safe place to stop and stay. According to the principles of Feng Shui, a red door symbolizes “welcome.” Perhaps more importantly than its historical meaning, though, is the fact that, according to the principles of Feng Shui, a red door is supposed to create a welcoming energy in your home. And the most exciting meaning: In Scotland, a red door means “mortgage-free,” since homeowners used to paint their front doors to announce to the world that they’d paid off their home. 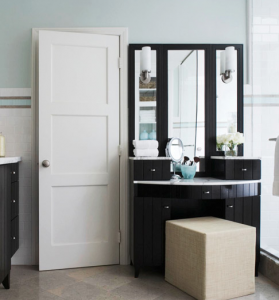 Although common practice is to remove a door before painting, you might as well paint it in place — that way, you can paint all sides at once and won’t have to rehang it. First, remove the knobs and hardware, and mask hinges. Use an oil-base sealer and primer to lock in the original finish, then use at least two coats of semigloss or gloss paint. First, you’ll need to clean the brick thoroughly. Use a wire brush and nonsudsy trisodium phosphate (TSP) to loosen grime. After the brick is clean, apply a primer. Use a stain-blocking primer to hide any soot stains. When choosing paint, consider that the higher the gloss, the more it will resist soot. High-temperature paints can be used on metal that’s part of the surround, but don’t paint the inside of a fireplace. Before painting trimwork, patch holes with surfacing compound and apply caulk to fill any gaps between the wall and the molding. Paint the trim before you paint the wall, or use painter’s tape to mask off the wall. Use a primer-sealer combinationto lock in the original finish and prevent bleed-through.Use a 4-inch foam roller to apply paint to trim, then go over it with a brush to cover the edges and grooves. Paint horizontal sections of trim with horizontal strokes and vertical sections with vertical strokes. Work on each piece of molding from the bottom up. It’s best to paint a room’s ceilings before you paint its walls. 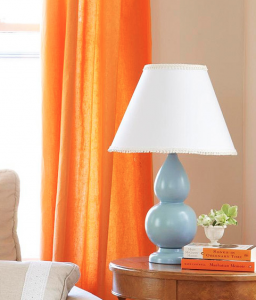 Use a roller with a telescoping handle and paint two coats: the first coat in the same direction as the major light source (such as a window) and a second coat perpendicular to the light. To make painting a white ceiling easier, several manufacturers offer paints that are pink or blue when applied but dry to a white finish. If you have a textured ceiling, expect to use 10-15 percent more paint.